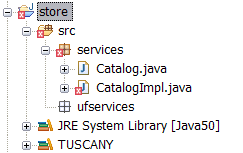 This article will show you how to download a Tuscany distribution, add the distribution as a user library in Eclipse, create the Store sample as a Java project, and then run the Store and use it from a web browser. Although this guide show some images based on the Java SCA 1.3.2 release, you should be able to use latest Java SCA release while going to the necessary steps for this guide. 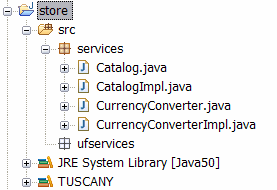 "Get Started with Store Demo in Eclipse video"
The first thing you do is to create a file system folder into which you will download the TUSCANY distribution. Next you download the latest release distribution. Launch your browser and enter the following URL. 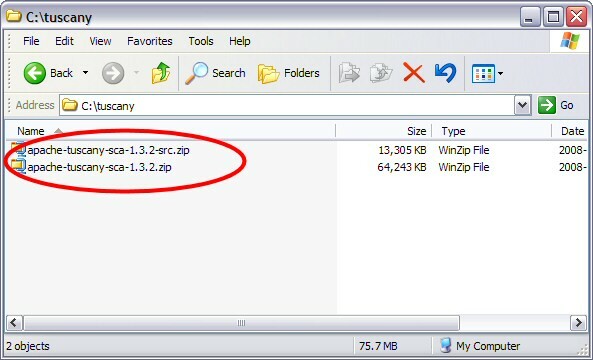 Download both the bin zip as well as the src zip to the folder that you created on your disk. Once you completed the download you should see the following on your disk. Next you unzip the bin zip in place, you should see the following folder file structure on your disk after unzip is complete. in its left navigation tree select Java, followed by Build Path, and followed by User Libraries. 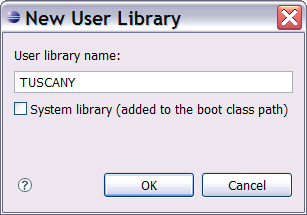 Select the New... pushbutton on the right of the New Libraries dialog to create a new user library. scroll down until you see the Tuscany runtime jar and select its Source attachment. to the select the Tuscany src zip that we downloaded earlier. service provided is that of an on-line store. 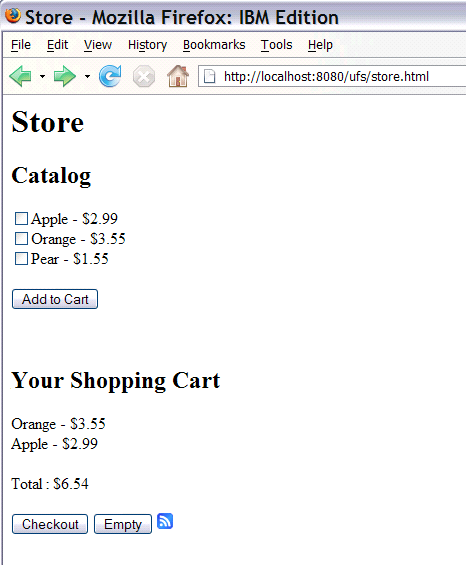 the Catalog and ShoppingCart service using the JSONRPC, and ATOM binding respectively. 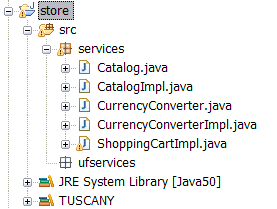 In this step you create a Java Project in Eclipse to hold the composite service application. 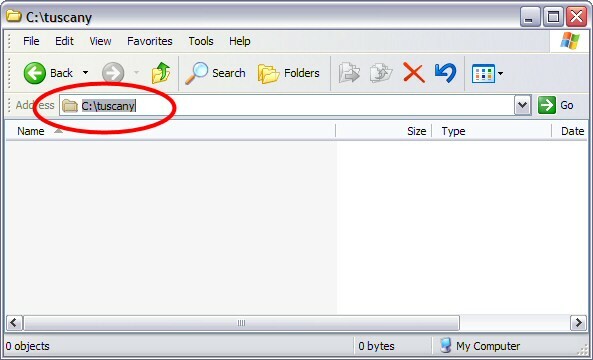 Click on the New Java Project button in the toolbar to launch the project creation dialog. folders for sources and class files. button on the right to add the TUSCANY user library to the project. Hit the Finish button to complete the New Java Project dialog to create the "store" java project. First you create two package folders into which later in this step you place service implementations. In the following you will place in the "services" package the regular services, and in the "ufservices"
package the user facing services of the composite service application you create. 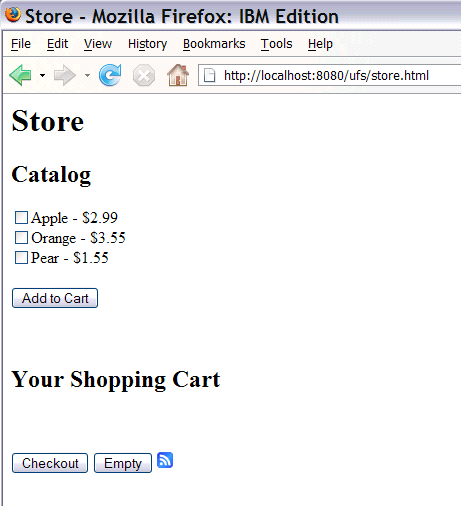 In this step you create the Catalog service interface and implementation. enter "Catalog" as the Name of the interface and select the Finish button to complete the dialog. copy-paste of the following Java interface code snippet. then select Finish to complete the dialog. copy-paste of the following Java class code snippet. After completing these steps the content of the "store" project will look as follows. In this step you create the CurrencyConverter service interface and implementation. You follow the same steps that you learned previously to create the interface and implementation. the following Java interface code snippet into it. the following Java class code snippet into it. In this step you create the Item model object, the Cart and Total service interfaces and the ShoppingCart service implementation. following code snippet into it. following Java class code snippet into it. 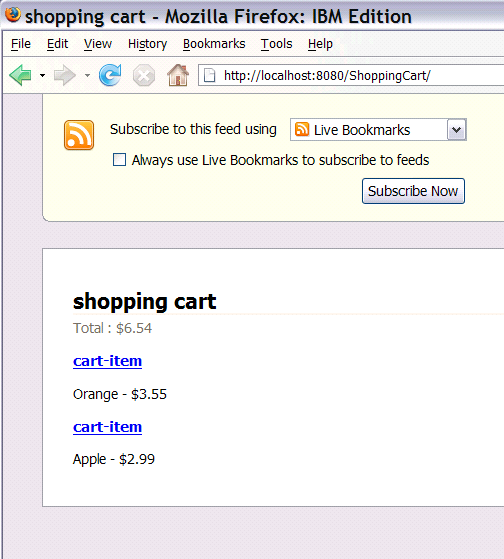 Note: Since the Tuscany conversational support is not ready yet the cart is realized through a hack. The cart field is defined as static. user interface to the other services you created. of the following html snippet. the store composite service. The composition is stored in a .composite file. copy-paste of the following composite snippet. 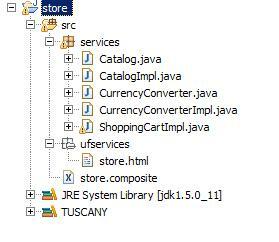 In this step you create the code to launch the Tuscany runtime with the new store composite service you created. 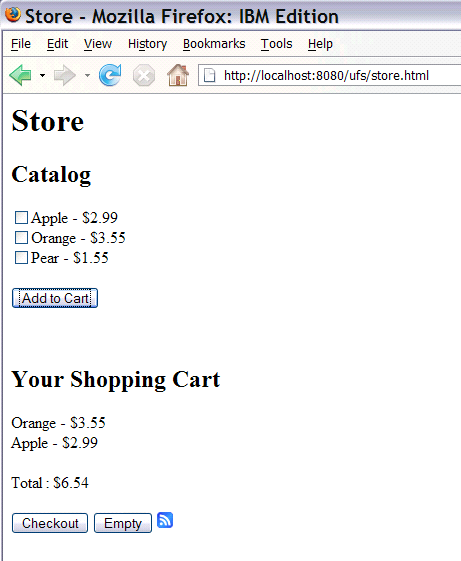 Select the "store" project and click on the New Java Package button in the toolbar to start the package creation dialog. Use the dialog to create a new package named "launch". Select the "launch" package. Select the New Java Class button . In the dialog enter "Launch" as the Name of the class, check the checkbox for creating a main method stub, and then select Finish to complete the dialog. The Java editor will open on the new created Java class. Replace the content of the editor by copy-paste of the following Java class code snippet. In this step you launch and use the store composite service application you created. the store composition to its domain. The Eclipse console will show the following messages. You get to the Store user facing service of the composite service application. You can select items from the Catalog and add them to your Shopping Cart. browser. Enter "admin" for both. shopping card content in ATOM feed form by clicking on the feed icon . You get the browsers default rendering for ATOM feeds. 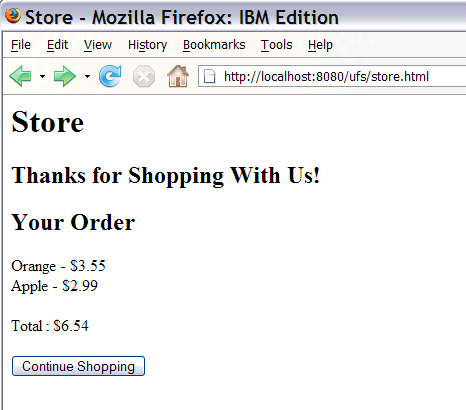 Use the browser back button to get back to the Store page. And then you can Checkout to complete your order. 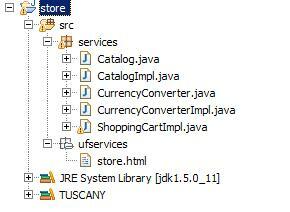 Congratulations, you have created an accessible, flexible, reusable Store application using Tuscany SCA technology.